Only one time during this stint did he not play the song on his trombone. “One Easter, my wife (Billie) sang, and I played the piano accompaniment,” he said. Griffin’s friend Dale Powell, church pianist, and Dale’s son Ben, church organist, have faithfully added to the tradition in recent years. “They know the accompaniment so well that they can do it by memory,” said Griffin. This past Easter, another enhancement was featured. Kevin Wallace, minister of music, had the choir sing the final chorus of the song. The performance, though, was not without drama. Earlier in the week, Dr. Jack took a spill that required 16 staples in his scalp and an overnight stay at the hospital. Even with the “war wounds” and the 16 staples, Griffin performed through it all, kept his playing streak going and played to the glory of God. 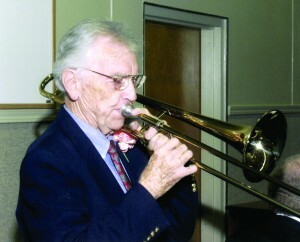 Griffin has been a member of Woodland Acres since 1980. Prior to performing at WABC, he also played “The Holy City” at Tulsa, Memorial and originally at First Christian Church in Tulsa. For 40 years he worked in administration for Tulsa Public Schools, retiring in 1987. Griffin lives on his own, does his own grocery shopping and meal preparations. About three times a week, Griffin meets with Dale, and they practice together. He said they enjoy playing medleys of hymns, such as “What a Friend We Have in Jesus,” “Near to the Heart of God” and “Near the Cross,” just to keep his embouchure up. His wife of 66 years passed away in 2008. Dr. Jack gives credit to his children and how they have helped him in his recent years. He has two sons, Mark and Brad, who live in the Tulsa area, and a daughter, Beth, who lives in Irving, Texas. Dr. Jack is an example of faithful service. His family is a demonstration of looking after parents when they are older (I Tim. 5:4). His friends and church family also are credited for supporting Dr. Jack and allowing him to faithfully perform every year. In return, everyone is blessed, and God must be pleased.